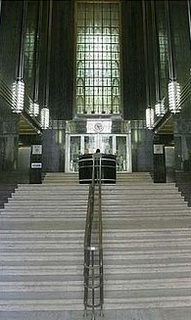 Built between 1936 and 1940, the Old Mutual building on the corner of Darling and Parliament Street in Cape Town remains the prime example of African-inspired Art Deco architecture in South Africa. 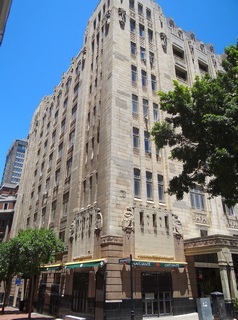 Together with the General Post Office building, opposite, it was for many years the tallest building in South Africa. Louw & Louw Architects designed the building, in association with FM Glennis. The design is a unique collaboration between architects, builders, sculptors and artists in its construction and decoration. It is one of the finest examples of Art Deco architecture in South Africa. It has one of the longest granite friezes in the world, stretching around the three sides of the building. The design, worked in granite, was made and supervised by Mr. Ivan Mitford-Barberton who was also responsible for the carvings in some of the function rooms in the building. On the Darling Street side the subjects are Van Riebeeck’s settlers arriving at the Cape and meeting the Hottentots and the 1820 settlers setting out to establish their homes in the interior. Dividing the two important groups of European immigrants are reliefs of South African flowers and animals. The frieze in Parliament Street has nine subjects depicting the history of the four Provinces of the Republic. 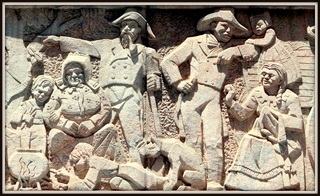 The first scene shows English sailors searching for letters behind a “Post Office” stone, the second depicts the building of the Castle withwomen and children helping and the third, the emancipation of the slaves. Captain Gardiner negotiating with Chaka represents Natal. Two episodes from the Great Trek represent the Free State, the dream of Nongkause represents the Black people section and the final two scenes show the early workings on the Diamond Fields and the Rand goldmines. Above the frieze are nine large native heads with the features and ornaments characteristic of their tribes, which are the major tribes of Southern Africa. Each of these figures has been carved out of a six-ton block of granite. Past the Elephant’s head at the corner in Longmarket Street are five scenes depicting nearby territories under British rule. The Friezes were commissioned in 1935 and completed in 1940. Namibia is represented by Diaz planting a cross on the coast; Zimbabwe by Cecil John Rhodes with the Matabele in the Matoppos; Zambia by Livingstone preaching, healing and freeing the Black people from slavery; the discovery of Kilimanjaro by the German missionary Rhebmann represents Tanganyika and the subject for Kenya is Fort Jesus being defended by the Arab inhabitants against the Turks. Beneath the Banana tree at the end of the frieze is the signature of the sculptor. Huge bronze doors lead into a spectacular foyer. 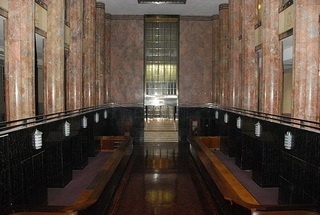 The walls are clad with black & brown-veined marble of polished Gauteng granite, plus a ceiling of gold leaf. Light fittings are chromium with sandblasted shades designed to add to the theatrical effect.The stainless steel lift doors, are engraved with 3 entwined anchors; the emblem of Old Mutual, and engravings of proteas and other South African wild flowers. The boardroom is very impressive, with tall windows and walls painted with delicate murals. It also features a frieze of carved wood, running around the room. The building was the head office of the Old Mutual for many years, until they moved to their new premises in Pinelands.